From templates you can print, to eCards that contain recorded messages, Wixie makes it easy to create Mother's Day and Father's Day messages parents will love. The Wixie Curriculum Library (Activities tab) includes sample templates for both Mother's Day and Father's Day in the appropriate Month by Month folders. 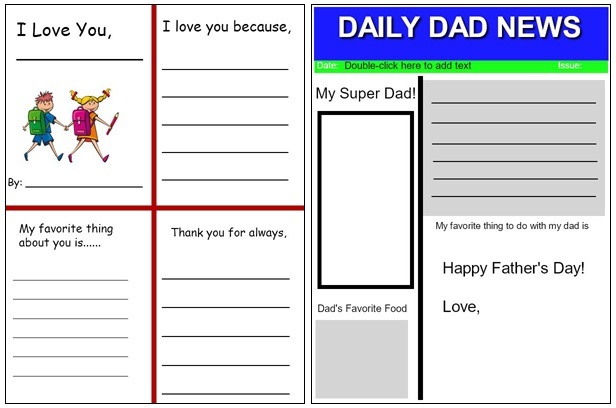 Similar to a web of character traits, the templates are designed for students to easily add what they love and are most thankful for about their parents. 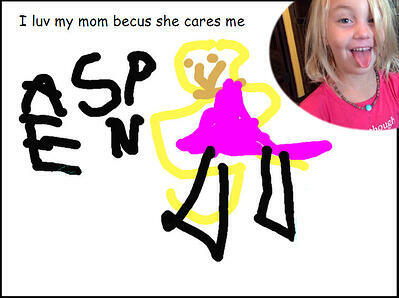 They can also use Wixie's paint tools to add original artwork to further show off their unique personalities. The Trading Post also has some great ideas, including the Mother's Day booklet and a Father's Day newspaper shown here. If you visit in May, there will probably be a few templates free to download from the home page, but if you create an account and log in, there are lots of great ideas created and shared by other Wixie-using educators! Use these instructions to add a Trading Post template to your Wixie account. It is hard to find a better gift than a unique card created by your child. While it takes more time and effort for you to manage while they are working in Wixie, simply having students open a blank project and add pictures and text makes for wonderful and unique cards. The Templates folder at the Project view also contains a Scratch Art folder that also makes for an easy way to create a design. Students simply click the Paint button and choose the Eraser to "scratch" their design. If they add text, they will need to change the color of the text to white (or another light color) on the Options panel. If your students have a lot to say, you can have them add and design more than one page in Wixie. Then, simply click the Send button, choose Print, and select Booklet to publish their work as a 4-page booklet you can print, fold, and share. If you are going to have students create multiple pages for their cards, consider sending them as eCards! Wixie projects are automatically saved online, so it is easy to share digitally with a player that makes it easy to see all of the pages. To send them to parents (especially those who are deployed), simply copy the project URL and paste it into an email. Combine electronic delivery with voice recording to move your eCards from simple to sublime. While their text and artwork are always adorable, it doesn't get much better than hearing the real voice of their son or daughter sharing the message! If your students need some inspiration, provide them with a pattern to start, such as the traditional "Roses are red, violets are blue." You can even challenge them to push their writing skills, like educator Suzy Abel. She read her students I Love You, A Rebus Poem by Jean Marzollo and challenged her students to come up with reverse rhymes for their I Love You message. No matter what you and your students decide to make for Mother's Day and Father's Day, have fun creating and sharing memories parents will treasure.